Charleston Headband is from Gypsy Renaissance's Headbands Collection. 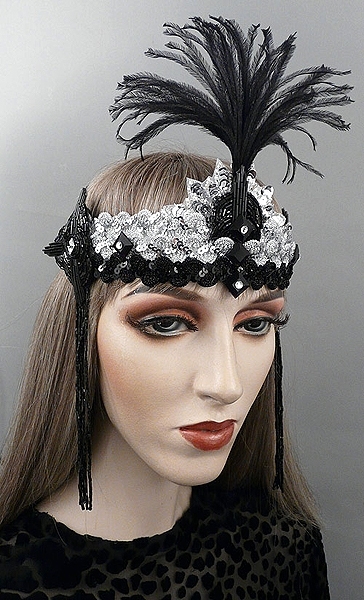 Charleston is a black flapper headband with a black ostrich plume and Swarovski crystals. Charleston is a stretch flapper headband fashioned with silver and black decorative trim and adorned with a black ostrich plume. 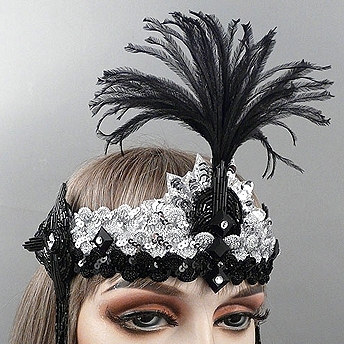 The headband is embellished with silver sequin and black glass beaded appliqués. Black glass beaded fringe hangs from both sides. Headband is finished with black jet jewels and Swarovski crystals.